Holy Family University (Holy Family), a small, private, liberal arts institution was considering reinstating a general chemistry major it had previously retired. However, the university was struggling to reach a decision that would satisfy the conflicting opinions of the faculty, who were proponents of the program, and senior administration, who opposed it. Hanover partnered with Holy Family to objectively evaluate the potential benefits of a general chemistry degree. 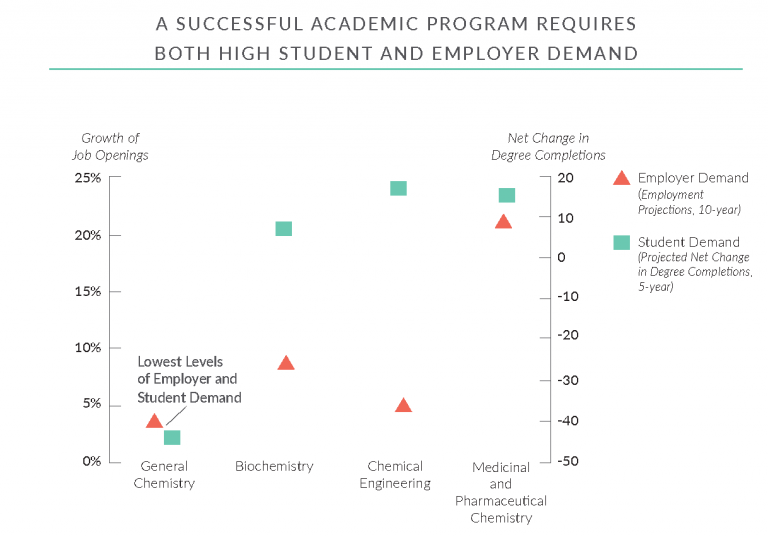 Employing a program evaluation, Hanover analyzed the general chemistry degree program according to student demand among peer institutions, employment forecasts, and the resources needed to support the program. While Holy Family had many of the requisite elements to launch a general chemistry degree, Hanover identified that the degree had the lowest student demand and forecasted employment prospects, compared to other specialized chemistry degrees. Saved money, time, and resources by not launching a low-demand program. Began adopting more evidence-based approaches to program launches.